I was curious to see what the changes would look like to my Family Finder results so without further ado, here's my upgraded information. Images courtesy of Family Tree DNA. The new Origins upgrade is comparable now to AncestryDNA and 23andme. 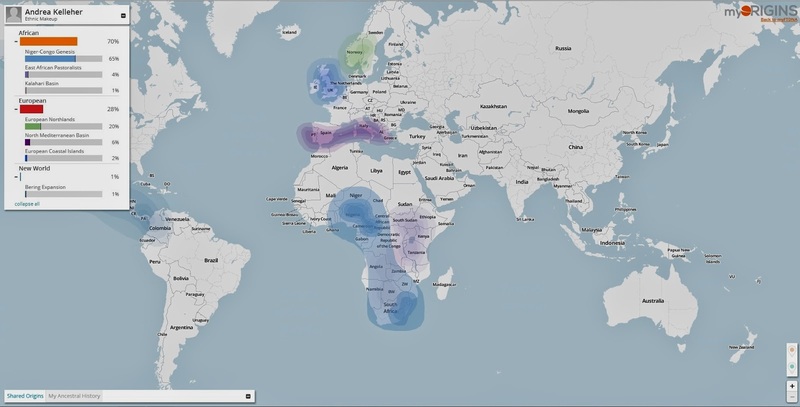 Family Tree DNA now provides a more specific ethnic breakdown of your results as well as a map showing the regions your DNA originated from shaded in. 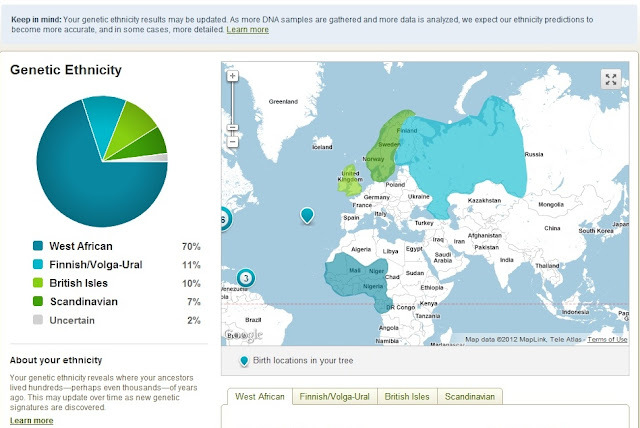 The updated result I find rather intriguing here is that I appear to have 6% North Mediterranean Basin DNA. This may back up the oral history regarding my Whitney family line. On my maternal line, my 2nd great grandfather Samuel Whitney born around 1856 supposedly came from a family of Portuguese decent. A couple of years ago I had written to my grand aunt Carrie who had this to say about her grandfather Samuel. I was told my grandfather's father's family originally came from the Azores Islands through Bermuda. He worked on a fishing boat that provided seafood in North Carolina. They were Portuguese decent and spoke Portuguese fluently. Grandfather Samuel was very fair skin with light green eyes and reddish blond hair. My mother, your great grandmother, had his completion. He died long before I was born. My mother had her DNA test done with the same company so I checked to see what her upgraded results looked like. Her results show 17% North Mediterranean Basin. Well, let's see if these results hold true in the future. If they do hold true it's kind of nice to see DNA results that back up the oral history. Now wait a minute! Where's my mother's Native American DNA? Hmmm. 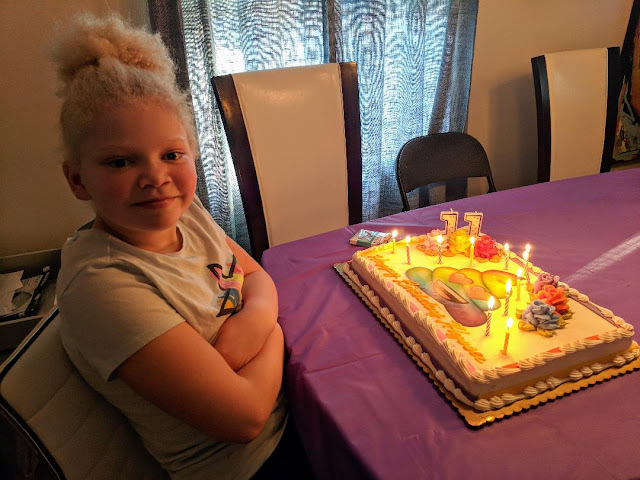 Her original Family Finder results didn't detect anything but I thought for sure with this upgrade she was going to show something since it's her side of the family with the oral history regarding Native American ancestry. My DNA results show I have 1% New World ancestry or Native American. Could this be statistical noise or does this DNA come from my paternal line? I guess I will have to wait and see what the next upgrade shows. You too, Kristin. 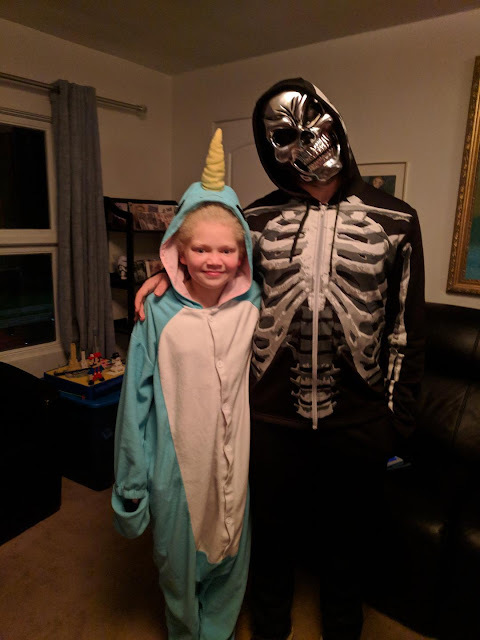 So my Mom isn't the only one. Did it show up in any of your other DNA tests? I am just curious. Andrea, Family Tree DNA doesn't assign Native American DNA unless you pay for it separately. 23 and me provides it without additional cost. You have learned so much about your admixture and so have I this DNA science is truly amazing! I received the myOrigins email as well. I haven't blogged about my results yet though. I have ancestry from Portugal as well, specifically the Azores and Madeira Islands. Thanks so much Jana for including me on your list! :) I can't wait to read about your results. 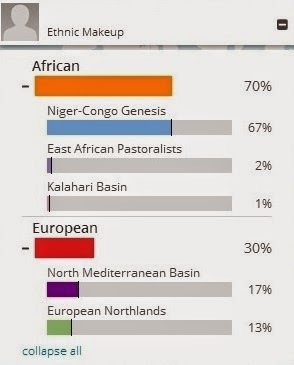 My maternal grandfather's Population Finder results 83.58% African and 16.42% European, both with plus or minus 0.10%. 83.58%+ 16.42%=100%. The myOrigins result is 86% African, 14% European and 1% New World (Native American, which I still don't know is significant or not, if I had 1% that'd be one thing but I would think if my grandfather had actual Native American it would be a little bit higher). 86%+14%+1=101%. As for the statistical noise that I've talked about a lot, I talked to FTDNA today and the operator swore they have neither statistical noise nor a margin of error. The operator told me the results totaled "101%" because the "Kalahari Basin" result was rounded. Do not know why they are giving African Americans "East African" results when I haven't seen any on 23andme assigned that. 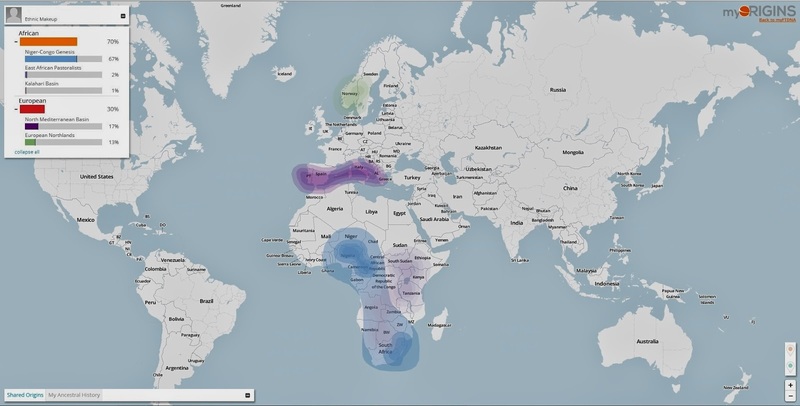 Still don't understand why they had gotten rid of so many of their reference populations (Population Finder had Yoruba and Mandinka for West African, now myOrigins only has Yoruba, African Americans can not have just one reference). Thanks for sharing. 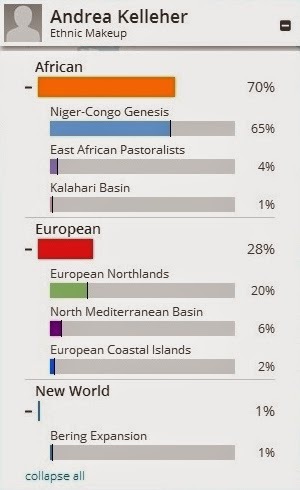 I've got to say about the "East African" myOrigins is giving AAs, when AAs are not getting that result on other companies,I might be wrong but I think it might be because FTDNA is only using one West African population now. Incredible. It's gotten even more extensive now. At least your lineage has been further solidified and fleshed out very well. Nothing like scientific data processes can bring to the usual leg work, I'd imagine.